If you follow my blog for a while, you must have known that I was of the bloggers that were invited to Parlez-moi d'Amour Perfume Launching Event a few weeks ago! Luxasia, the company who sells this fragrances in Indonesia finally sent me a 80ml bottle of Parlez-moi d'Amour as a review purpose, completed with a love letter. Why? 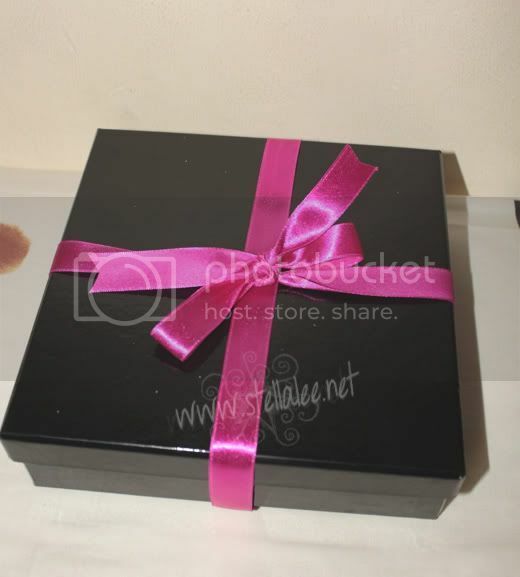 Because Parlez-moi d'Amour is translated as "speak to me about love"
The package is sent directly by the staff in a sleek box, completed with a pink ribbon! The 80ml Parlez-moi d'Amour perfume brand new in a box with the love letter. A little bit of John Galliano, he's an eccentric fashion designer and also a make up artist, and he's launched his own perfume line as well. And Parlez-moi d'Amour is his latest creation. Nonetheless to say, he's an artistic human being. John Galliano is a romantic and a story teller, so when creating this product, he created the story along the scent. Taylor Momsen was chosen to be the brand ambassador for this line, and she's perfect for this role! I love it! The packaging is really cute! It's inspired by love letter, therefore it's packaging is like a love letter in a glass cut bottle, completed with a rose stamp on the upper right side. Parlez-moi d'Amour Eau de Toilette captures intrigue and romance, this is new generation of first love fragrance! The scent itself is a mixture between blueberry, ginger, and bergamot. It also has a hint of Jasmin Sambac, Lavender Oil, and Turkis Rose. Not to forget the help of Musk, Patchouli Indonesia, and Cypress to give more impression in this product. It's the combination of musk, fruit, and floral, a really nice sensation perfume that you can't forget and will be addicted to it once you've smelled once! I love this product so much! It gives a rock sensation once you spray it on your wrist, but after a while the scent will be replaced with a romantic and fun scent! When I close my eyes and smell it, the color of black and soft pink are mixed in this fragrance. I'm in love with this product! 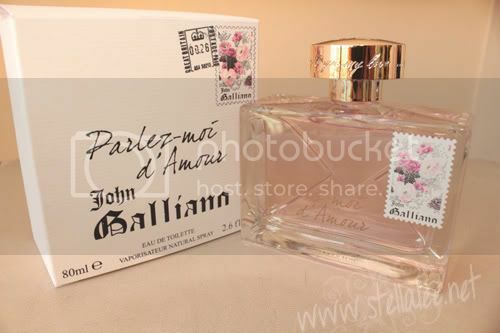 John Galliano Parlez-moi d'Amour perfume will be available in Indonesia by October 2011. You can purchase it in either Gandaria City and Central Park's SOGO if you live in Jakarta. More outlets coming soon. You can take a visit to the outlets when it's opened, and take a smell of the perfume. I'm sure you can't hate it because it's just so sweet! My friends and family love this scent as well, and I have to hide it so my mom won't steal it away ROFL and you know, even my friends who dont like perfume, when smelling it, they say that it's okay, compared than any other scents that they've known. Crazy right, How can this perfume can be liked by many? GIVE IT A TRY! I haven't seen it at the mall yet, am really curious. gotta check it out later when it comes out. yes, its not available yet in Indonesia. Probably by October :) please take a visit on the counter because it smells so good! iya parfumnya wanginya enak bgt mi :3 nanti cobain deh hehehe..
Stella you are sooooo beautiful! Gosh, I told you on fb, but I will tell you again. I LOVE how you look. So stylish and pretty. Never let anyone change you!